Building the soft power of any given society is building a nation. A well-built and developed nation is also the very means to building strong economic development of any given society. So, investing in any activity that impacts the development of skills of individuals in different fields is indeed part and parcel of a nation’s comprehensive development. Involvement of individuals, communities, and associations in the process of nurturing competent nationals is a determining factor that alleviates Government’s burden of providing nationals with all necessities. Although upgrading the skills of all nationals with available resources is of paramount importance, giving utmost priority to people with disabilities is a matchless noble and benevolent action. 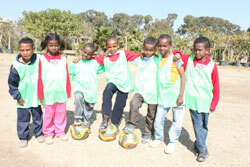 Such act of benevolence has been the cherished desire of Eritreans at individual, community and association levels. Helping visually-impaired people and others with physical disabilities as well as assisting people who live with down syndrome and autism is indeed moral obligation of every national. There is no doubt that every Eritrean wants to assist fellow Eritreans in a number of societal challenges, but there are some who could be considered as role models to influence others participate in such benevolent service. The nobility of the idea of assisting people in need is undoubtedly an action that needs to be sustained as far as such problems exist. What is more important is not to talk about the people who have been active in extending assistance, but about the noble gesture they set out to realize. Some people are always alert in noticing the major challenges that need be addressed instantly and others may notice the prevalence of challenges a bit late. But, as long as there is a cherished desire to be part of the decent act of helping others, it doesn’t matter whether one starts to engage oneself in such act early or late. Let’s see an experience of one Eritrean family who have been committed to assist people with disabilities with whatever resources it has. However, it is more important to talk about the philanthropic act. The family of late Doctor Kidane Ghebremariam is an epitome which bestowed itself in assisting people with challenges of different nature. This family, consisting of parents and their four children, came back home from Europe in 1997. In this very same year, it started to help visually-impaired, hearing-impaired, as well as people with autism and Down syndrome. In that year, as a sign of its readiness to do much more in the years to come, this family started its assistance with the contribution of computers and book shelves. The family allotted huge expenses and then decided to visit students with disabilities every New Year. It has continued to participate in such act for the last 17 years with the same spirit of determination. Members of the beneficiaries have now risen to 300. This family entertains the students with music shows and covers every travel, food and drinks and other recreational expenses. The students who have been pursuing their education in Abrhar Bahta Primary School for the visually-impaired and in Akria Lutheran School for the hearing-impaired, and in Medeber Primary School for people with Down syndrome and autism enjoy the coming of every New Year in the Expo grounds and at Techno garden. Our main objective is to encourage and assist them morally, but the morally satisfaction we obtain from them outweighs by far than the endeavor we exert. Let’s see the opinion of the school directory of the aforementioned three schools one by one about the philanthropic act of this family. Mr. Medhin Yohannes, Director of a Lutheran School for the visually-impaired said that the students consider each New Year as the greatest feast and they are always eager to be part of the eagerly awaited feast. What is more is that, all student greet Mrs. Abeba with great enthusiasm whenever they meet her anywhere else. Mr. Tezare Aynealem, Director of Abraha Barhta Primary School for the visually-impaired also shares that same view. He puts his impression about her saying “Mrs. Abea is the mother of this School.” He also said that the students of this school consider her as Mother Teresa. It is worth mentioning that such act of benevolence is the responsibility of every national. Mr. Tezare is of the idea that once such philanthropic act was disseminated on the National Television, it attracted a number of people who are willing to participate in such noble act. As has been mentioned in a number of times, the benevolent act of assisting people in need is inherent moral obligation of every Eritrean. Not confining to giving them monetary assistance, Mrs. Abeba has also been offering in-kind presents to the students of Abrha Bahtra. “Such act has been very helpful in strengthening the self-confidence of the students,” Mr. Tezare Said. Mrs. Abea finally said that the moral satisfaction I gain from such activity is worth nothing. “What really satisfies me more than anything else is the readiness of our children to follow our footsteps,” She said. They all come from abroad to join the entertainment program held in the New Year. The noble act of this family indeed deserves appreciation. It is not difficult to guess the amount of money that has been spent each year to assist the student of the aforementioned schools, but Mrs. Abeba is reluctant to mention it. What one could guess from the information obtained from the directors of the two schools hints that the family has been spending too much for the about 300 students of the three schools. This very family has been doing its level best to assist nationals with disabilities become self-reliant as much as it could, but it would be more rewarded if others follow its footsteps.